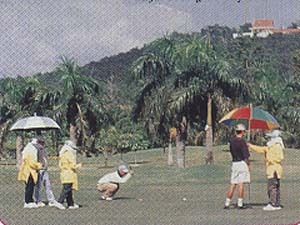 Photo: Chiang Mai-Lamphun Golf Club. 2 rounds (or 3) at some of the top golf courses in the area of the northern capital are the highlights of this program. There is also time left for excursions and sightseeing in- and around Chiang Mai. 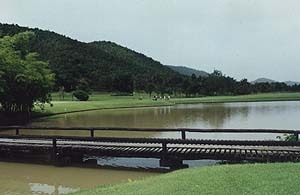 Photo: Royal Chiang Mai Golf Club. On arrival transfer to the hotel in the center of the northern capital. Enjoy a welcome dinner and get more information about Northern Thailand. Morning transfer to Chiang Mai-Lamphun Golf Club, located approx. 25 km outside the city. Enjoy a first round of golf. On the way back to your hotel you have the opportunity to visit some of the local handicraft centers, such as silver- and lacquer ware, woodcarving etc. Transfer and play another round of golf. You have the choice between Green Valley Golf Club or Royal Chiang Mai Golf Club!. Transfer back to the hotel. 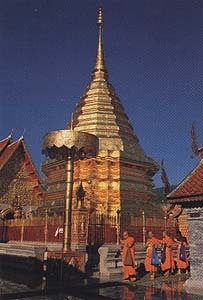 There is time left for some sightseeing in Chiang Mai, like Doi Suthep mountain temple. Our tour guide with driver and vehicle is ready to serve you! Today you have the choice again! Enjoy a half day mini safari which includes an elephant ride and a “lazy” trip down the river on a bamboo raft……or play another round of golf at the course which you like most. Late afternoon transfer to the airport, or extend your stay in Chiang Mai.